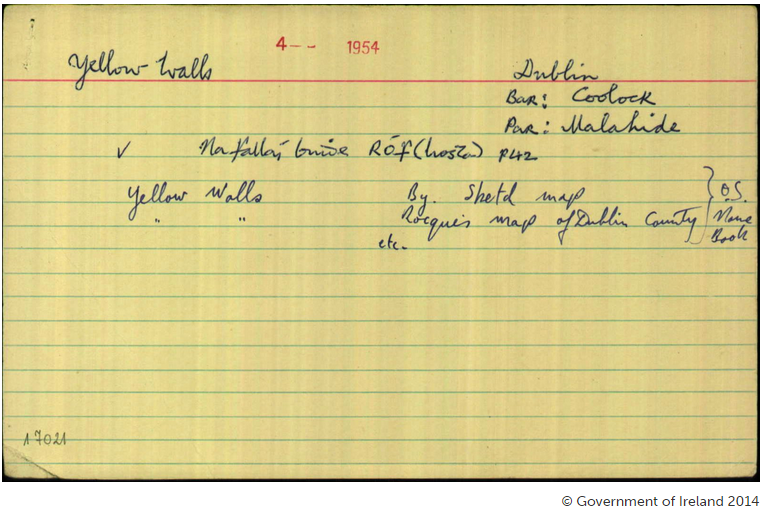 The origin of the name “Yellow Walls” has two popular explanations. One is that it is derived from a one-time local ‘cottage’ industry of weaving linen from flax fibres extracted from the stems of the flax plant. In its natural state, flax fibre ranges in colour from pale yellow or cream to dark brown. Raw linen woven from flax fibres naturally has a yellowish colour so in order to get white linen, the fabric must be bleached. This, it is said, was done by hanging the fabric on walls in the locality to bleach in the sun, resulting in yellow stains on the stone, hence “Yellow Walls”. There is also a reference to flax in the Schools’ Collection of the National Folklore Collection of Ireland, an initiative from the 1930s which encouraged Irish schoolchildren to collect and document their local folklore and history. There are some fields near Yellow Walls called “The Ponds” and long ago there used to be flax mills there. So there were ponds of water necessary to steep the flax. In those fields there are two large walls which used to prevent the water from going further and so all the water was kept together. Those fields are now called “The Ponds” by everyone. There was a mill in Yellow Walls but it was used to process cotton rather than flax. 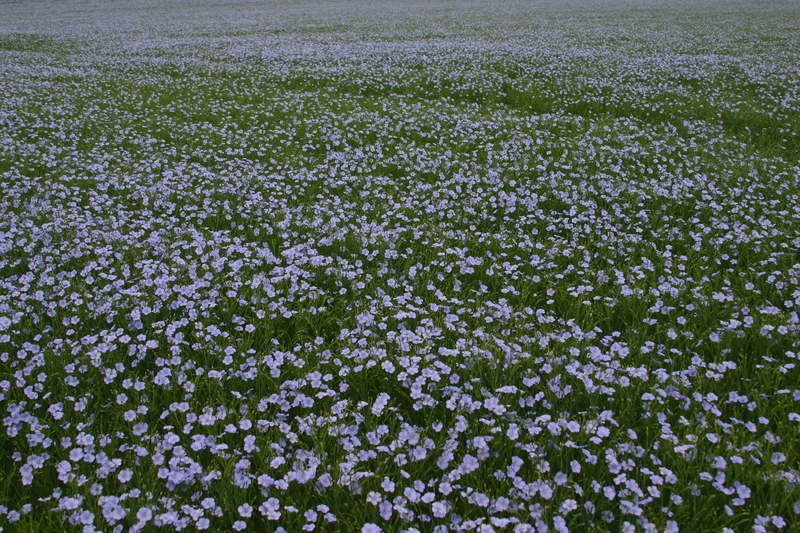 There may though have been some flax-related activities on the site that predated the cotton mill. 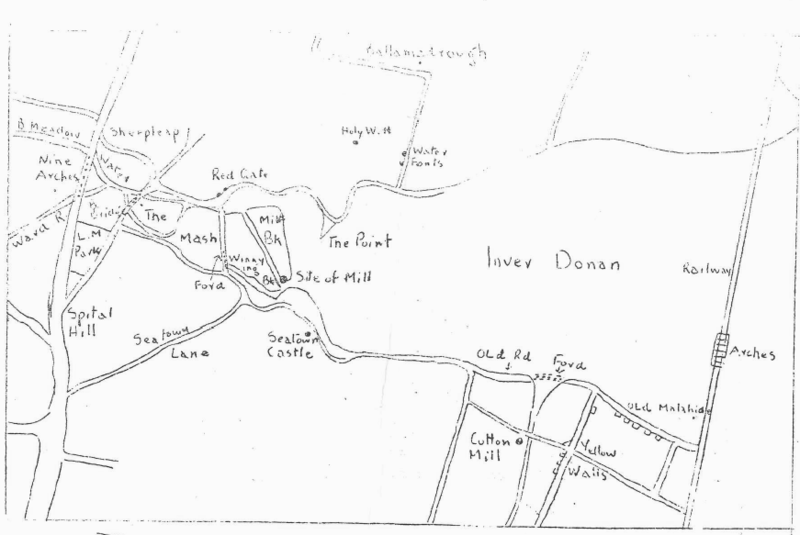 The name “Yellow Walls” dates from at least the eighteenth century, appearing on Rocque’s 1756 map of County Dublin. This is before Lord Talbot built his cotton mill at Barrack Bridge. The origins of the name then are not associated with dyeing or bleaching of textiles manufactured in the mill. Hamon is a Norman form of the Old Norse word Hamundr, a personal name that was used amongst the Vikings of Dublin before the Anglo-Norman invasion.4 The name ‘Hamonstown’ reflects Malahide’s links with these early inhabitants of Fingal. Malahide has been a lordship or manor in the Talbot family for centuries, having courts leet or baron, and comprising the towns and lands of Feltrim, Hamonstown, Balvenstowns, &c.
An inquisition was taken in 1547 concerning the tithes of Malahide; which finds that they issue from the lands called “the Courte de Malahyd” and Balregan. Sometime – probably in the late 17th to early 18th centuries – the name changed, but why? When looking for the origins of a placename, it is useful to look at places with similar or identical names for clues and pointers. According to the Placenames Database of Ireland,6 there are three other Yellow Walls townlands in Ireland – two in county Dublin at Palmerstown and Mulhuddart and one near Navan in county Meath. Original record from the Placenames Commission for Yellow Walls, Malahide. Source: www.logainm.ie. The second explanation for ‘Yellow Walls’ lies in the craft of textile dyeing. Traditional dyeing in 17th and 18th century Ireland involved using natural dyestuffs derived mostly from plant sources. One of the most popular colours for clothing in 17th century Ireland was saffron – a shade of yellow.12 The saffron plant provides the dye of the same name but very large numbers of plants would have been needed to provide even modest quantities making it impractical and too expensive for widespread use. The name ‘saffron’ then was applied to a yellow colour derived from any dye source. Yellow wild woad is also known as yellow weed, dyer’s weed or weld. This dye can be used for cotton, wool, silk, and linen. Among the common plants of the Malahide flora are a few species widely distributed in the British Isles which are recognized in the Irish-speaking districts of Ireland as having economic or medicinal properties. The Irish names of these species, though not now current in or around Malahide, are still in daily use throughout Gaelic Ireland. Such common species are buide mor, Weld (Reseda Luteola)…The virtues of some of these are still remembered by the Malahide country folk. Finally, it is worth mentioning another possible source of the Yellow Walls name. In the Illustrated Guide to Historical Malahide we learn that “one old resident states that when silk was being manufactured here long ago from the cocoons of silkworms, the bleaching of the silken material was the cause of the yellow stains.”1 There may be some truth in this – an 18th century account of silk manufacture relates how raw silk produced by silk worms is yellow and that “yellow silk, partly bleached by soap, being exposed for four or five days to the sun, is rendered of many shades of white”.15 There is also a reference to “the unemployed silk-weavers” of Yellow Walls being given employment in the Talbot cotton mill. 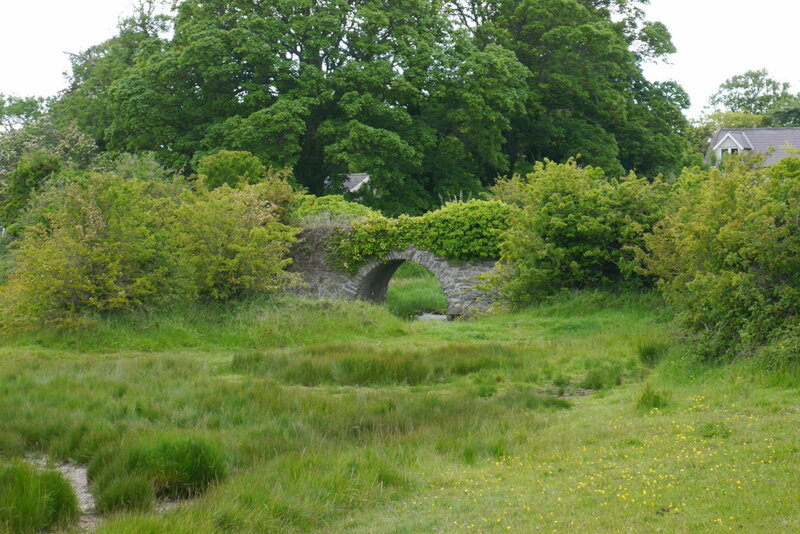 *There is another “lost village” just across the Broadmeadow estuary from Yellow Walls called Ballymadrough. It is also recorded as “Ballamadrough”. Historian Patrick O’Neill attributes the name to the Irish “Bealach M’Eadrog”, the way or pass of Eadar. 1. O’Shea, Tom. Illustrated Guide to Historical Malahide. 2. Malahide Historical Society Newsletter, December 1994. 3. Byrne, Joseph. The Motte, Wheatfield, Portmarnock. Fingal Studies, No. 2, Winter 2011. Fingal County Libraries. 4. Woulfe, Patrick. Irish Names and Surnames. Genealogical Publishing Company, 2010. 5. D’Alton, John. The History of the County of Dublin. Hodges and Smith, 1838. 6. Placenames Database of Ireland [online]. 7. McAsey, Carmel. Chapelizod, Co. Dublin. Dublin Historical Record, Volume 17, Nr. 2. Old Dublin Society, March, 1962. 8. National Inventory of Architectural Heritage [online]. 9. Palmerstown – Walking Tour, South Dublin County History [online]. 10. Ball, Francis Elrington. A history of the county Dublin: the people, parishes and antiquities from the earliest times to the close of the eighteenth century, Volume 6. Alex Thom, 1920. 11. Oliveira, Tiago; Powell, Ronan; McGarry, Christopher; Lombard, Maria. Land Use, Urban Design and Transportation Framework for Navan. SIAS in association with McHugh Consultants, Grontmij and O’Connor Sutton Cronin, 2002. 12. Walsh, Robert, Warburton, John, Whitelaw, James. History of the City of Dublin, from the Earliest Accounts to the Present Time. T. Cadell and W. Davies, 1818. 13. Lucas, AT. Furze: A Survey and History of Its Uses in Ireland. An Cumann Le Béaloideas Éireann/The Folklore of Ireland Society, 1958. 14. Power, Patrick. The Place-Names of Decies. Cork, 1952. 15. Peirce, D (Ed.). Observer and Record of Agriculture, Science and Art, Volume 1. Merrihew and Thompson, 1801. 16. O’Neill, Patrick. An Macalla, No. 10, April 08, 1962. 17. Historic Road Bridges Project – Volume 2. John Cronin and Associates for Fingal County Council. 18. Schools’ Collection of the National Folklore Collection of Ireland. Available online at Dúchas.ie. 19. Vandeleur, WE. Notes on Malahide. W. Tempest, Dundalk. Dundalgen Press, 1915.